Lisa D. Writes: Happy Birthday Wolfsbane CONTEST! I'm in the middle of an insane day, but I wanted to stop by and tell you all to go wish my fab critique partner, Andrea Cremer, a HAPPY BOOK BIRTHDAY! It's been over a year since I read Wolfsbane, and I'm still thinking about it! You NEED this book! SQUEE. Thanks for the giveaway! been waiting for this book 2! both books look awesome! YAYAYAY! Congrats to Andrea! 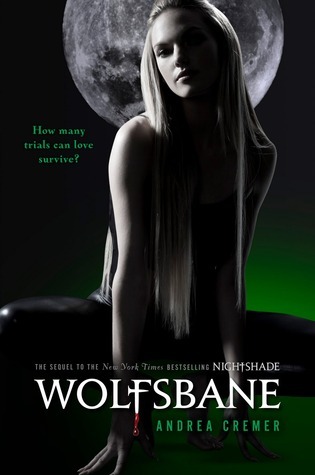 :) Cannot wait to read Wolfsbane! Thanks for the giveaway Lisa! im really excited for both these books! THANKS FOR THE GIVEAWAY! I've shared on facebook, so expect a few more Irish readers to come a calling! Thank you for the giveaway! These are some pretty great sequels! Thanks for the shout out, Lisa!!! I would love to win this, heard a lot of good things about Wolfsbane! Thanks for this sweet give-away, especially for making it international! I'd love to win these! please count me in and thanks so much for the chance to win. Awesome books!! 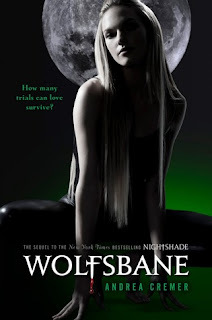 OH I love book release day such awesome books are coming out especially Wolfsbane.which I have been wanting to read. Your generosity never ceases to astound me! I am dying to read BOTH of these! Thank you! Thanks for the giveaway I've heard great things about Andrea Cremer. Fantastic contest! I would love to win!! thanks for a chance to win its a great giveaway!!! Sign me up for a chance to win your book and Andrea's! I know I would like to get my hands on 'em! How nice of you. Would love to won. I would love to read both of these! I want to read both of these very badly! Please enter me!!!!PLEASE!!!!!!!!!!!!!!!!!!!!!!!! Oh my both of these books are the awesomesauce I so cannot wait. I'd love to get my hands on a copy of this! Thanks for the chance to win! Ooops! Forgot to mention that I also shared on facebook! Awesome giveaway.I'd love to win this. SQUEE! Really appreciate this giveaway. Fingers crossed. Count me in!! thanks for the great giveaway. Oh Lisa! You have the most awesome giveaways. Thank you so much. ouuu both books look fantastic! yay for sequels C:Thanks for the giveaway! YAY! Thanks! I loved the first book in both of these series. Oo la la, fantastic giveaway.Considered me entered. Amazing contest!! I retweeted your post about the contest (@DPhilipose). Thank you for such a fab opportunity!! Currently in the middle of reading Original Sin. Freakin' loving it! Can't wait to finish it. Thank you for the giveaway, Lisa! You rock. Awesome giveaway, thanks. ashelynnhetland at gmail dot com. omg!! what a great contest!!! would love to win these books!! been dying to read both!!! Great giveaway. Thanks for the chance!! Need finished copy of Original Sin! Need to read Wolfsbane! NEED! I'm looking forward to both of these so much! Thanks for the giveaway. I do want it and it is open Internationally as well so I actually have a chance. Wow..I need to open my computer more often. So I want to enter in your giveaway because I don't want Original Sin...I NEED IT. And Wolfsbane always interested me, Andrea Cremer is a great writer. Would love to read this!!!!! I'm so excited to read wolfsbane,the only bookstore near me doesnt have it. So thanks for the give away! Awesome giveaway! I sooo wanna read this!! and here is the link to the tweet! great books for a contest! i can't wait to read them! Can't get more awesome than that! I hope I'm not too late to enter. Thanks for hosting such an awesome giveaway. Want it sooo bad.. cant wait to read it, thanks for this giveaway. *waves hand in the air, hops up and down* I want it! Me! Pick me! Ahh I really want to win! My email is kcalalang36 at yahoo dot com. It's that simple. But anyway for me this book was great. I didn't want to put my nook down and when i did i hurried back wondering what would happen next. I loved the cliffhanger and am anxiously awaiting for Bloodrose to come out!